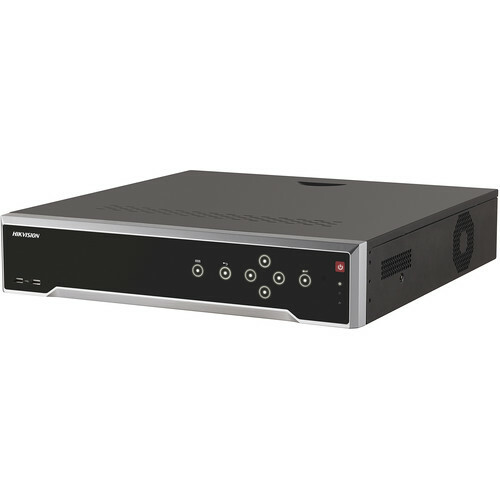 Stream and record up to 32 video channels with the DS-7732NI-I4/16P 32-Channel 12MP PoE Plug-and-Play NVR with 24TB HDD from Hikvision, at resolutions of up to 3840 x 2160. Equipped with four SATA ports, the NVR can support up to 24TB of storage (24TB pre-installed). External storage options include network servers, USB storage devices, and eSATA devices. Sixteen PoE ports provide power and video connection to network cameras. H.265+, H.265, H.264+, H.264, and MPEG-4 compression are supported, enabling you to choose the format that works best for your application. The NVR enables simultaneous playback of up to 16 channels at resolutions up to 3840 x 2160 via its HDMI and VGA ports. Up to 32 channels can be simultaneously recorded at full frame rate in 12MP, 8MP, 6MP, 5MP, 4MP, 3MP, 1080p, UXGA, 720p, VGA, 4CIF, DCIF, 2CIF, CIF, or QCIF resolution, with a maximum combined transfer speed of 256 Mbps. The NVR is equipped with RCA connectors for bi-directional audio, as well as with an RS-485 serial interface.